Resource Book by Carol M Bechtel. A Resource Book is recommended for each participant. Large print edition also available. View the Leader Kit here which contains this Resource Book and the Leader's Disk with session plans and activities, videos, slide presentation and an audio exercise. Customize this flyer to announce your study. Use as bulletin insert, newsletter ad, or poster. There was never a time when the book of Job was not relevant, but it is especially so today. This is not because the book of Job has changed, but because we have. We may be more ready to listen now ... less certain of our own answers. So, when Job asks "why," we, too, strain to hear the answers. And if answers are not forthcoming, then we, like Job, will need to learn how to live without them. The book of Job cuts straight to the heart of what it means to be human. It is the most profound exploration of the life of faith ever written, and wrestles with some of life's most perplexing questions. Why do bad things happen to good people? Is there a correspondence between sin and suffering, obedience and blessing? Why should we serve God if there are no guarantees of blessings and freedom from loss and harm? 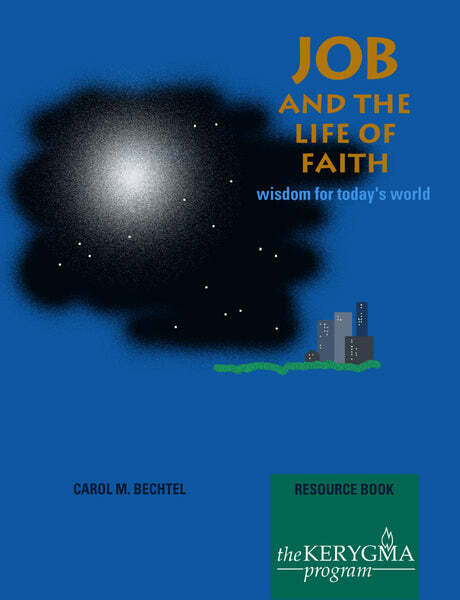 Carol M. Bechtel, author of Hallelujah: The Bible and Handel's Messiah and Sowing Tears, Reaping Joy: The Bible and Brahms’ Requiem, contends that the real theme of Job is defining the limits of human wisdom. God does not answer Job's questions about suffering, but reminds Job that he's out of his league. We do not have all of the answers; God does. Faith, as Job comes to understand it, is an exercise in radical trust. Find more Old Testament Studies or additional www.kerygma.com products.